Remember the Jaguar, Atari's grand folly of a 64-bit machine that proved to be the final nail in the coffin of its console division? More specifically, do you remember the controller? That humungous chunk of black plastic, covered in more buttons than a Sergeant Pepper costume shop? 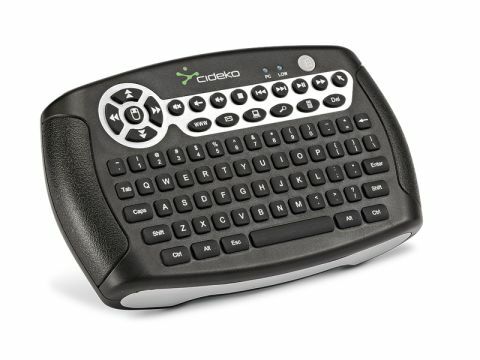 Cideko's Air Keyboard recalls that console-killing controller, which has been universally cited as the worst controller in the history of man. There are a few differences. The Air Keyboard doesn't work with a 15-year old console, it connects to your PC via the magic medium of USB. It's also completely wireless. It packs a tiny rubberised keyboard, and mouse buttons on the shoulders, as well as an accelerometer, which means you can move the cursor by simply wiggling the entire controller at the screen. It is a rather chunky solution, and it takes a while to get used to. We've seen similar products with Gyration's motion-sensing mice and keyboards, but this is the first to stick everything in one unit. It does work, though, and once you've got your thumbs around the tiny keys it's surprisingly fluid. The motion-control stuff is a tad too sensitive, but it will work far better with a large-screen TV hooked up to a media centre than my 22-inch work monitor. And, whereas the Gyration just about worked with FPSs, this simply doesn't, although it fares far better with RTSs. Overall, this is not a bad little unit, and one that will be perfectly at home on your lounge table. Next to your Atari Jaguar Controller, of course.